At Beelman Dental, patient care goes far beyond just teeth and gums. Most people tend to clench and grind our teeth at times, especially when stressed – but millions of Americans suffer chronic teeth grinding and clenching as part of a jaw disorder known as TMJ or TMD. Dr. Beelman provides treatment that can help prevent jaw pain, as well as headaches. We want you to live a healthy, pain-free life, and would love to help stop chronic pain at the source with TMJ/TMD treatment. 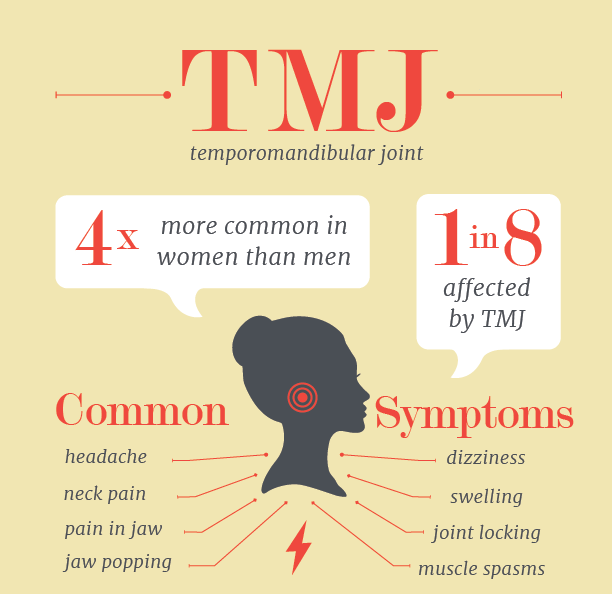 TMJ stands for the temporomandibular joint. TMD stands for temporomandibular joint dysfunction — a term used to describe any jaw joint pain or problem. These two terms are often used interchangeably and are sometimes even called TMJD, which makes things confusing. For clarity, we’ll use TMJ to describe the joint itself, and TMD to describe the dysfunction. There are many possible causes that contribute to the development of TMD. One of the most common factors is stress, which can lead to holding tension in the jaw and chronic teeth grinding and clenching, also known as bruxism. TMD can also be the result of misaligned teeth, bite problems, or traumatic injury to or problems with the structure of the joint itself. 90% of TMD sufferers are women in their childbearing years, which makes sense when we think about stress. Aside from stress, other factors help explain this gender discrepancy. Women who take hormonal birth control tend to report higher instances of TMD, which could be due to hormone receptors in the female jaw that are not found in the jaws of the male. There may also be differences in the physical joint structure of female jaws versus male jaws. Women tend to have more vitamin deficiencies affecting their joints and are more likely than men to report adverse physical symptoms and to seek medical care to relieve them. TMD appears as chronic pain and tension in the jaw that radiates into face, head, neck, and shoulders. If you clench and grind your teeth frequently or suffer from chronic headaches and migraines, TMD could be causing your pain. TMD may also stiffen the jaw, making it difficult to open and close your mouth. You may experience popping, locking, or clicking or the jaw when you speak, eat, or yawn. If anything described above sounds familiar, you may be one of millions of Americans suffering from TMD. If you’re tired of taking endless painkillers and still living in pain, we would love to help you treat your pain at the source. We don’t just treat your symptoms, we stop pain from happening in the first place. To be able to deliver optimum treatment for you, we need to understand what’s causing your dysfunction. Depending on the cause and the severity of your case, we’ve suggested a few home care tips below – and if necessary, Beelman Dental can fit you with a custom mouthguard to help correct the problem, minimize the damage, and put an end to your chronic pain. As they say about so many things, the first step is recognizing you have a problem. Be mindful of when you start getting stressed and begin to clench and grind—then make a conscious effort to stop. You can do gentle stretching and massage techniques to ease your tension, using a cold compress to reduce pain and swelling if you feel it would provide some relief. Avoid chewing gum or other habits that may inflame the jaw. One of the biggest factors that causes and exacerbates TMD symptoms is teeth grinding and clenching. Custom-made mouthguards or nightguards can work wonders to lessen nightly tension caused by clenching, grinding and protecting teeth from being worn down over time. A mouthguard could be all it takes to put an end to your chronic pain. Ready to End Jaw Pain & Headaches? If you have any questions about TMJ/TMD or would like to schedule an appointment with your Bedford dentist, Dr. Beelman at Beelman Dental, give us a call today at (817) 409-3830 or request an appointment online below. We’ll take the time to make you smile!